Genetically Engineered Foods? Not on My Plate! | Idealist Girl! This week I received my ballot for the fall elections. There are a lot of important things to vote for (or against) this cycle, even though it’s an “off” year. Initiative 522 is at the top of my list. 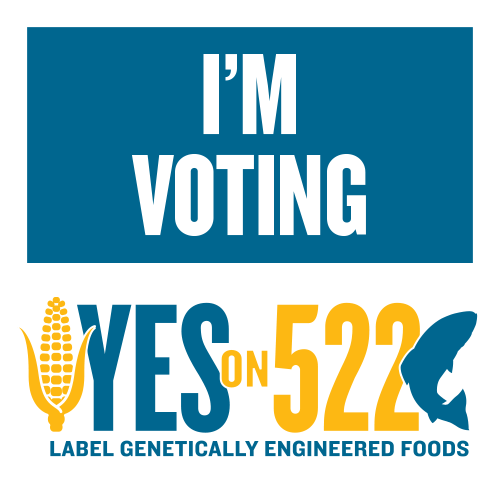 522 calls for the labeling of foods that are genetically modified, aka GMOs. It was put on Washington’s ballot through a citizen’s initiative, gathering a whopping 353,331 signatures in support of the labeling of genetically engineered foods. Money has been pouring in from Big Ag companies like Monsanto, Coca Cola, Pepsi, Nestle and the like in an attempt to defeat 522. In my book, anything that Monsanto opposes is reason enough for me to support it. While there are myriad reasons to hate their business practices, what really pushed me over the edge was terminator seed technology, a feat of genetic engineering in which crops are specifically designed to produce sterile seed. This forces farmers (even poor farmers in developing nations whose economic subsistence depends on the ability to save seed from year to year) to return to Monsanto each year in order to purchase seeds. It also prevents crops from adapting to local growing conditions. Evil, evil stuff. Whether or not GMOs are hazardous to human health is hotly debated. GMO supporters will say that there is lack of scientific evidence that GMOs are unsafe, which is not the same as proving that they are safe. Coincidentally, Big Ag companies like Monsanto have blocked numerous research attempts by claiming “trade secret infringement” and other legal blockades. This L.A. Times article outlines the problem quite thoroughly. I think the best that can be said about GMOs is that we don’t know if they are safe. Since I have a household full of food allergy sufferers, I would prefer to avoid exposing them to food of unknown safety or possible allergenic contamination. I want to be an informed consumer. I have the right to know what’s in my food. I want labeling. Beyond the potential and contested health effects, and even more important to me personally, are the environmental consequences of growing genetically modified foods, which include increased pesticide use, habitat loss, pollinator genocide and crop contamination. Pesticide use: One of the great promises of genetically engineered (GE) crops was that they were supposed to require less pesticide use. Instead, we have RoundUp resistant weeds which are leading to increased use of pesticides. In fact, recent reports indicate that herbicide use has increased ten-fold on farms using Monsanto corn. Increased herbicide use goes hand-in-hand with increased insecticide use, as it eliminates plants that are necessary for attracting beneficial insects. Habitat loss: In the days of old, a buffer of plants surrounded the perimeter of fields. These hedges were home to many types of insects, birds and other creatures that contributed to the biodiversity of the area. With the advent of RoundUp ready crops, a GE technology which “protects” food crops from being sensitive to the herbicide glyphosate, large quantities of RoundUp are sprayed willy-nilly, wiping out every plant in the vicinity of the crops. The milkweed that feeds monarchs? Gone! Wild seeds and bugs that feed birds? Gone! Pollinator genocide: It seemed like a good idea at the time – genetically engineer crops to include a naturally occurring bacterium, Bacillus thuringiensis (Bt), that is toxic to corn borer worms. That way the corn would be protected from the worms without having to spray insecticides. But who could predict that Bt corn wouldn’t be species specific? Yep, Bt wipes out monarch larvae and is possibly a contributor to the honey bees’ Colony Collapse Disorder. It also kills other bugs that serve as food for birds, bats and small mammals, with repercussions all the way of the food chain. Crop contamination: The crux of the problem is that we don’t know if GMOs are safe (for humans or the environment), but that hasn’t stopped us from releasing them into the environment. Many crops, such as corn, are wind pollinated. So, if you plant GE corn in one field, the wind will carry its pollen to neighboring fields where it will pollinate the corn there. It is impossible to keep it from spreading. Should it ever be shown that GE corn is harmful enough that we want to eliminate it, the horse will be too far out of the barn to call it back. It is probably already too late, as GE corn has showed up in parts of Mexico where it was never planted. This puts the biodiversity of maize at risk, as well as pollinators who eat corn carrying the Bt gene. Many supporters of GMO foods point to the promise of the “Green Revolution” to use genetic modifications to help increase the yield of crops as well as the nutritional quality of foods for people in the most food insecure areas. This is one use of GMO technology that seems like a net win for humanity. At this time, the promise has not lived up to the hype. “Golden rice” has been touted as a solution to vitamin deficiencies, yet after 30 years of research, it is still not being used. What is actually improving health in developing nations is nutritional education and access to kitchen gardens. Turns out that if people eat a varied diet that includes veggies, they don’t need golden rice. Crazy. Crop yield can be increased using organic methods that also help the crops resist weather extremes. So, while genetic engineering might be one part of the solution, it’s definitely not the only one. Possibly not even a necessary one. Until genetic engineering starts living up to its promise, I don’t care to support it with my dollars. I won’t be supporting it with my vote either. 522 doesn’t make genetic engineering illegal. It simply requires foods to be labeled so that people can have the information they want. Vote Yes on 522!